Electric. Green. Environmental. Automakers are focusing on manufacturing more vehicles that do not run on gas, calling it the wave of the future. At the North American International Auto Show in in Detroit, Cadillac and Infiniti announced new electric cars are on the way, and Volvo, Buick and others are expected to follow suit. 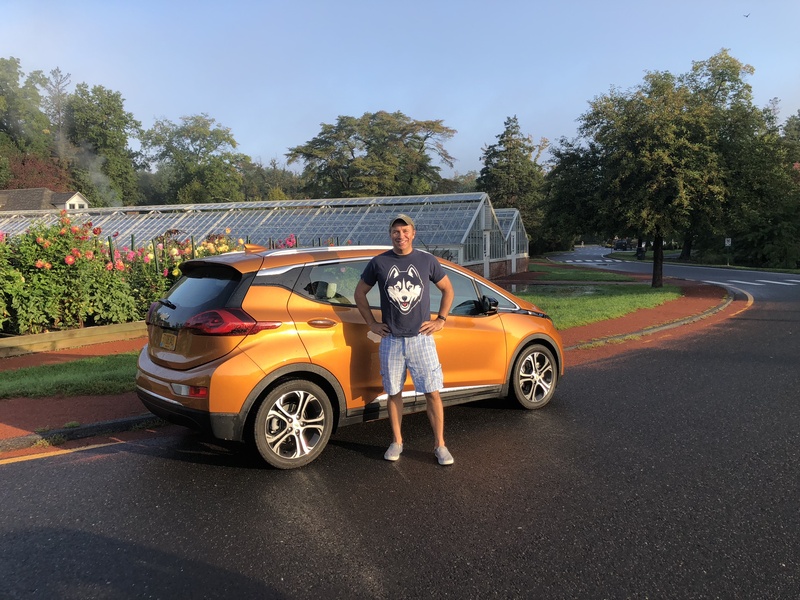 I had the opportunity to try out the Chevrolet Bolt, which is not a hybrid, but rather completely powered by a battery that must be charged. If you don’t charge it, it won’t move, and unlike the Chevrolet Volt, there is no gas tank to fuel the engine when the power is out. The Bolt has a range of 238 miles on a single charge. It was given to me with a full charge and off I went for the next week. I plugged it in at home, at the Connecticut Convention Center at Adriaen’s Landing in Hartford, UConn in Storrs, WFSB in Rocky Hill, West Hartford Center and Bishop’s corner and another place I’ll get to in a moment. Finding places to charge was pretty easy. I was told to download an app that directed me to the nearest charging station. That’s how I found the one in Bishop’s Corner when I went grocery shopping. I plugged in the Bolt and walked across the street to Walgreen’s and Whole Foods. We took a family trip to Newport Rhode Island, which is just under 190 miles round trip. We left with a full charge and when we began our return trip we had just under 100 miles left on the battery, according to the computer on the dashboard. With four people in the car perhaps the Bolt was burning a little more juice than expected and Kara was concerned we wouldn’t make it back. We checked the app and found a charging station in Norwich right at Illiano’s Restaurant. Perfect. The kids were hungry! We stopped in, plugged in and dug into some chicken parm and pizza. The Illiano’s charge added about 30 miles to our range in the short time we were there, more than enough cushion to finish the journey to Hartford. A few things to keep in mind if you are considering going electric. You need to get a special outlet at your house. I plugged in to a normal outlet at our house and the Bolt battery picked up only four miles in range every hour. Do the math, and you’ll see an overnight charge in a normal house doesn’t do much. I’d also be concerned about the influx of electric cars versus charging stations. Even at WFSB, there were a few times our three charging spots were taken. Ditto at Bishop’s Corner and Blue Back Square. Clearly as demand increases, more charging stations will need be built. Overall, we loved the Bolt, and loved not going to the gas station, though we did stop on the way to Rhode Island for snacks for the kids. Kara and I would definitely consider the Bolt. It held a surfboard and bags, but we need a bigger car for our family at this time, so I think we’ll wait for the Bolt’s technology to show up in a crossover, station wagon or SUV. If Buick comes out with a plug-in Buick Electra (is there a better name for an electric car that also has such rich automotive history?) we may have to drive that! By the way, the sticker price on our Chevrolet Bolt tester was $38,000.